Beer, or at least something like what we call beer today, has actually been an extremely important part of human history. For a long time, beer was actually one of the only clean, safe sources of drinking water available to us, and in large part, thanks to yeast. Back before we even knew what yeast was, we knew that drinking beer was safer than drinking water straight from a river, lake or well. We didn't know why at the time, but the whole process of making beer kills microorganisms, such as parasites, bacteria and fungus, that are harmful to us, and pretty much all of the microorganisms that are harmful to us (yeast is actually a fungus, but isn't harmful to us) can't survive in even the tiny amounts of alcohol found in beer, so beer stays safe to drink months, even years after having been brewed. What makes the alcohol that keeps the beer safe to drink? The yeast, of course. But what about today, when clean, safe drinking water is plentiful in first world nations, why drink it now? Well, despite what some people would have you believe, beer is actually fairly nutritious. Beer is a source of protein, some complex carbohydrates, potassium, and various vitamin B complexes such as niacin and folic acid. Yeast is directly responsible for the vitamin B found in beer. OK, lets not kid ourselves. We don't drink beer for the nutritional value, we drink beer for the way it tastes, and for the small amount of alcohol it provides. But that's OK. There's nothing wrong with drinking beer as long as it's done responsibly. OK, back to yeast. As I said, yeast provides the alcohol in beer, and can also provide carbonation as both alcohol and CO2 are waste products for the yeast. Yeast also adds a lot to the flavor of the beer. Some yeast strains will help bring out the malty flavor of the beer, or accentuate the hops. Some yeast strains, such as Belgian yeast strains, will give the beer a strong fruity or spicy flavor. You can easily test this to see the difference that yeast can give the beer yourself by splitting a batch of wort into two different fermenters, and pitch a different yeast in each fermenter. Yeast can also contribute to a lot of the off flavors in beer, such as making the beer taste cidery, or buttery, or fruity when you're really not looking for a fruity tasting beer. Yeast will also clean up a lot of these off flavors if left to their own devices. Lets talk a little about the choices we have for yeast. First off, don't buy baker's yeast to ferment beer. It will ferment the beer, a bit, but it's generally not very alcohol tolerant, so it might not ferment out as far as you'd like, and baker's yeast generally doesn't have as stringent quality control as brewing yeast, and for good reason. If you're making bread, you're only going to let the yeast interact with the dough for a few hours as most before baking the bread. If you have another microorganism in with the yeast, it really isn't going to have time to cause any real issues with the bread before it's baked. On the other hand, you're going to let your brewing yeast remain in with your beer for days, if not months or years, so a little acetobacter or lactobacillus will have plenty of time to start multiplying and changing the flavor of your beer considerably. So what about our choices for brewer's yeast? First we have dry yeast. One of the great things about dry yeast is that the process of drying the yeast preserves the yeast really well, so it won't degrade much over time. It's also packed with nutrients to help kick start the yeast once you add it to your beer, and you can get a lot of healthy yeast packed in a really small container, so one packet of yeast is enough to brew 5 gallons of beer without a problem. Dry yeast is also very inexpensive when compared to liquid yeast. The downside of the dry yeast is that there just isn't a very wide selection of dry yeasts to choose from, so you're pretty limited in what you can do with the beer, as far as changing the yeast goes. Dry yeast is also typically very clean fermenting, so you don't end up with much for off-flavors, but sometimes you actually want the off flavors to add complexity to the beer. Another down side of liquid yeast is that it tends to be fairly expensive, making up to 1/4 the cost of the entire beer you make. You can mitigate this cost a bit by reusing the yeast. After you've fermented a batch of beer, most of the yeast falls out of suspension, and ends up at the bottom of your fermenter. After you remove the beer, you can pour another batch of wort on top of that yeast cake, and then you don't have to pitch any more yeast. The yeast at the bottom of the fermenter will be more than enough to ferment another batch of beer. You'll want to reuse the yeast cake within about a week, and you'll want to make sure you don't needlessly expose the yeast to other microorganisms, so keep it covered. If you just reuse the yeast at the bottom of the fermenter in this fashion, you will end up with a little of the beer from the first batch getting into the second batch of beer. This means any flavors from the first batch will be added to the second. You can always make the same recipe, but that can get boring, so just make sure the flavors from the first beer won't be unacceptable in the second batch. If the first batch was a double IPA, you probably wouldn't want the second batch to be an american light lager. An easy way to account for the flavors of the first batch is to simply make the first batch a lighter tasting beer, and make the second batch a bit stronger tasting. Another possibility, to remove the non-yeast part of the trub (trub is the sediment at the bottom of the fermenter, not all of which is yeast), and remove most of the flavor influence of the previous batch of beer is to wash the yeast. I'll try to write an article on washing yeast in the future. Many American breweries will reuse yeast for up to 10 generations of yeast, but Belgian breweries have been known to use the same yeast cake for upwards of 100 generations of yeast. Along with your normal brewer's yeast, you can also get some specialty yeasts and bacteria to really change the way your beer tastes. Brettanomyces, lactobacillus, acetobacter and pediococcus can all be added to your beer to add interesting, unique flavors. If you do ever work with these non-traditional microorganisms, it's a good idea to have a separate set of equipment for the fermentation and bottling/kegging of the beer so you don't inadvertently infect other batches of beer. For the homebrew scale, 200 billion yeast cells is considered to be roughly the right amount of yeast to use for a 5 gallon batch of beer. On the commercial scale, even this wouldn't be nearly enough. You do want enough healthy yeast to minimize off-flavors and to make sure the beer is fully fermented. If you don't have enough healthy yeast, the yeast may produce more of the compounds that contribute to off-flavors, and may even give up on fermenting before all the fermentable sugar is gone. Preparing dry yeast is easy. Generally speaking, a packet of dry yeast has enough viable yeast to brew a 5 gallon batch of beer as-is. You should let it get to room temperature before pitching (actually, you should get it to the temperature of the wort you're intending on pitching the yeast into.) After letting the yeast get to room temperature, you can "proof" the yeast, which basically means you're making sure the yeast is still good by putting it in a small water/sugar mixture to see if it starts to ferment in the mixture before pitching it in your wort. Liquid yeast might require a bit more work to get ready to ferment your batch of beer. Wyeast guarantees their activator yeast packages to have at least 100 billion viable yeast cells at the time of packaging. White labs used to advertise their vials of yeast as containing roughly 50 billion viable yeast cells, but upped it to 100 billion a few years ago. Unfortunately, 100 billion viable yeast cells is roughly half of what we need for healthy fermentation, and the cell count starts going down fairly rapidly after packaging (by the time it leaves the factory, it's down to roughly 95% viability). You could always pitch multiple packages of yeast in your wort to get enough yeast, but liquid yeast isn't cheap. A good alternative is to make a yeast starter. A yeast starter is basically a tiny batch of beer, with the specific purpose of generating more yeast to pitch in your larger batch of beer. While there are a variety of calculators out there for figuring out the size of the yeast starter you'll need, Mr. Malty's Pitching Rate Calculator is generally considered the definitive resource to use. Before we make the starter, you're going to want to take the yeast out of the refrigerator and let it warm to room temperature. The yeast, as it warms up, will start giving off some CO2. If the yeast is in a vial, you may want to periodically unscrew the top a little to let the excess CO2 escape, and then seal the vial again. If you have a Wyeast smack pack, there will be a small packet of yeast nutrient inside the main container, you'll want to smack your package of yeast hard enough to rupture this nutrient packet. The smack pack will then slowly inflate as the yeast wakes up and starts consuming the nutrients. The following recipe I'm going to give you is a great starting point for making a yeast starter, but it may not be the right size starter for all batches of beer you make. You basically make it like any other beer. Dissolve the malt extract in the water, bring it to a boil and add the hops. In this case though, you really only need to boil for about 10 minutes, just long enough to kill anything that might have been living in any of the ingredients. You then cool it, put it in an appropriately sized container (I like to use a growler), shake it up really well to aerate the wort, pitch your yeast and then use something to cover the container that will let the CO2 out. I actually use an airlock, but some people just use a piece of sanitized aluminum foil. Let it ferment for 2-3 days, and it will be ready to pitch in your bigger batch of beer. You might find that your starter is getting so large you don't want to pour the whole thing in your large batch of beer (for a higher gravity beer, you may need to make a 1 gallon starter). If that's the case, after the starter has finished fermenting, place it in your refrigerator for a day or two, so the yeast all falls out of suspension, and then pour most of the liquid off the top. Just be sure to leave enough liquid in the container so you can shake the yeast up enough so it's not completely stuck to the bottom. I hope this gives you a good primer in yeast and how to use it in your beer. I'm sure I'll have another post somewhere down the line with a little more in-depth information on yeast. 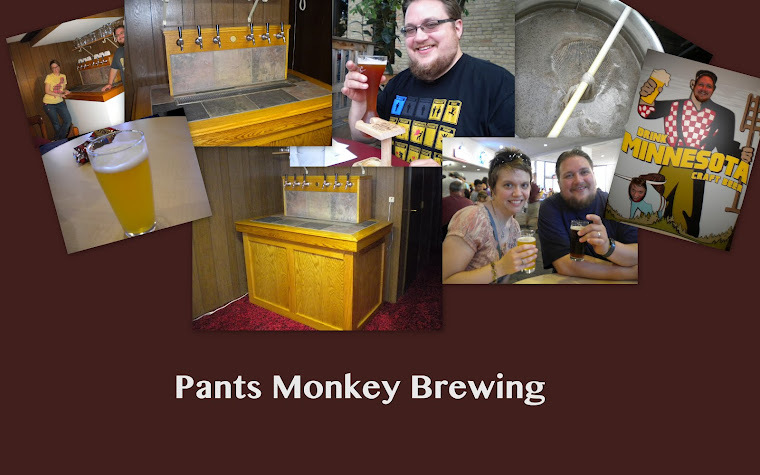 Next week will be a guest post from my wife on being a woman in the world of homebrew.